HH THE AGA KHAN VISITS INDIA - 2006-09-20 | Ismaili.NET - Heritage F.I.E.L.D. India: His Highness the Aga Khan spent 4 days in India. He met officials in Dehli, layed the foundation stone of the AgaKhan Academy in Hyderabad, and also met with his followers. It gives me great pleasure and immense satisfaction to associate myself on the auspicious occasion of laying the foundation stone ceremony of the Aga Khan Academy at Hyderabad. His Highness Sri Aga Khan requires no introduction to this august gathering here. Yet to refresh our memories, Sri Aga Khan has become Imam at the age of 20, one of the youngest hereditary spiritual leaders in the world. Let me begin by thanking all of you for honoring us by joining in this celebration – at this truly magnificent site. We are most deeply grateful to all who helped to make this site available to our Academy program. Your generosity will be a continuing inspiration to us all. The Department for Women, Children, Disabled and Senior Citizens (DWCD) will soon have a project monitoring unit (PMU) to monitor the data of children, pregnant and lactating mothers served by the Anganwadi centres across the State. The DWCD has entered into a Memorandum of Understanding with the Aga Khan Foundation which has agreed to support the PMU. Currently, the department’s internal IT Cell is digitising the data uploaded by Anganwadi supervisors. Hyderabad: The first phase of the restoration of the Quli Qutb Shahi Tombs taken up by the Aga Khan Trust for Culture (AKTC) would be completed by January next year, said Telangana Tourism secretary B Venkatesham here on Friday. Days after its inauguration, the Deccan Park is a roaring hit among the locals with hundreds of people thronging the 32-acre park. On Sunday, about 6,000 people visited the park which is a non-ticketed facility as of now. A mammoth undertaking to restore and develop Delhi’s Nizamuddin will end this time next year. How has it transformed one of the most historic and touristy areas of the country? Prince Aga Khan, the spiritual leader of Ismaili community, Friday rejected the notion that tension and violence in today's world was a result of clash of civilisations, especially between the Islamic world and the West. 'I disagree with this assessment. In my view it is a clash of ignorance which is to blame,' he told a gathering at the foundation laying ceremony of the Aga Khan Academy for Excellence in Education on the city outskirts. 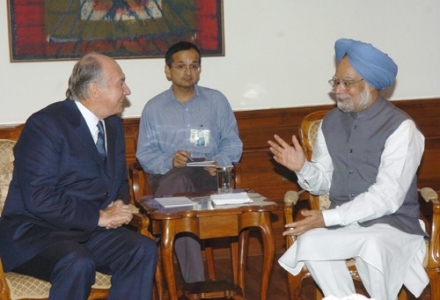 Wednesday, 2006, September 20 - India: His Highness the Aga Khan spent 4 days in India. He met officials in Dehli, layed the foundation stone of the AgaKhan Academy in Hyderabad, and also met with his followers.